I could NOT AGREE MORE STELLA!!! You are the absolute BEST at setting forth new, creative and FINALLY (whew!) easy to understand directions! I have been at this for over 40 years, and I thought that perhaps there was a secret language that I was not let in on when I was a child learning from my grandmother. Now, I know that it’s not just me!! I have cried, ripped out, thought myself an idiot, fudged, you name it…I’ve done it, just to make some of the simplest patterns (on paper, anyway). We all need to pitch in and build a monument to your ability to communicate AND to take pictures at the logical time in a process! Heck, I had even given up knitting years ago, and have picked it back up again because of your ability to COMMUNICATE!!! I will bake you the pie of your choice…..your favorite desert……cookie….you name it, I will happily put you in the desert of the month club for all this amazing work!! thanks so much for all the free patterns; they are great. This is an easy and beautiful pattern. After making one scarf I turned the pattern 90 degrees and started with fifty treble/chain spaces – did row 2 and then 3 & 4 four times and ended the yarn, turned the piece around and worked in the other half of the treble/chain spaces for the same number of rows. This gives a scallop on the long sides, a very pretty look. Gorgeous, gorgeous, gorgeous! 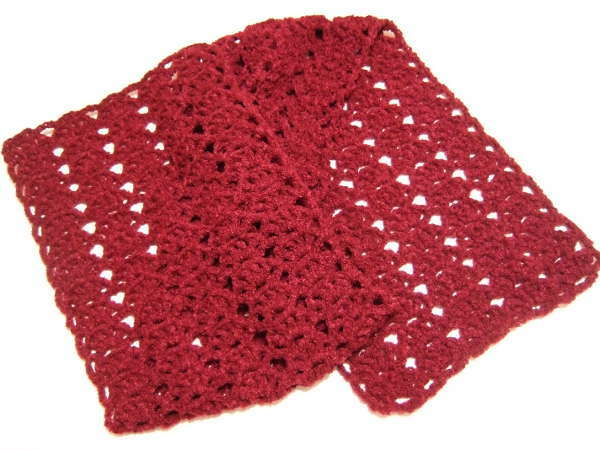 Most of the beautiful lace scarf patterns are for knitters, and I never thought I’d find one so pretty for crochet. Thank you so much! Do you think we could persuade Fairfax Avenue to share a photo of her edging. It sounds lovely. @wyominggal… I added no edging. It’s the actual pattern stitch. Instead of working many short rows, I worked few long rows and the scallops were the result. Love this pattern and can’t wait to make it! I don’t mind working into a chain but your technique is innovative and has lots of design possibilities. Thanks so much for this pattern. I am going to check out your other patterns as well! Finally I understand what no foundation crocheting is! And I love this…I have made a pattern similar but it always bugged me because one end would be straight or I’d have to add a scallop afterwards so it matched the other end….can’t wait to try this!!! Thank you! I cannot wait to do this! Gorgeous! I too am glad to see such a lacy and airy pattern for crochet. Thanks! Thank you so very much for these patterns, especially the “no chain” foundation. I love working with the Homespun yarn from Lion, but they are very difficult to work with because of the fuzziness of the yarn. I end up doing a big granny rectangle or something similar where I dont have too look for the hole to insert the hook. Also, as above, thank you, thank you, thank you… for the pictures and easy to understand patterns. I too have difficulty understanding patterns unless they are in a diagram form. I’m *thrilled* to have found your patterns – thank you so very much! I’m a new crocheter and a convert, having been a knitter who always seemed drawn to patterns that had a crochet effect. I’ve turned this pattern sideways and am crocheting a beautiful shawl 62″ long for my son’s wedding from the gold-flecked light brown Filatura di Crosa Fancy by Gioiello. I’m in the middle of it now. If I decide make a crochet trim on the edges, how would you suggest I do that in the foundation chain? I’ve read Fairfax Avenue’s comment and that’s appealing. If you have time to pass along any other idea, it would be so appreciated! (I have some books on trim checked out from the public library but am overwhelmed by the variety and none of them address fuzzy yarn.) Thank you once again! Love this pattern. How would I make it narrower, to 6 inches? My projects seem to end up a little wider, probably due to the yarn tension. Appreciate your thoughts. Start with 5 tr/ch spaces. hello I agree with everyone , your patterns are easy to follow. I make prayer shawls and I will be using a number of your stitches, so thank you very much. and I will be checking in for more new ideals. Pls. clarify the shell dc chain 1 three times then dc again? Is there a video of this pattern? It is hard to see it in the picture.Thank you. I haven’t made a video of this one yet. Sorry. This made like a usual shell where multiple stitches are made in one space or stitch. This shell has four dc that are made into the same stitch, but for this shell a ch is made between each of the dc. This is what makes the shell lacy. When you say to make a stitch “over” a stitch, do you mean not actually into the stitch like normal crochet? How do you crochet over a stitch? I can understand how you would crochet over a chain space, meaning not go into the stitch but just go under the space (which i guess would be the same thing as stitching over it) but how do i crochet over a double crochet? why not into it? i’m so confused but your pattern looks so pretty i want to get it right. thank you! I’m so glad you asked about this because this caused me to read over the pattern and I realized that one of my “over”s, the one in row 4, should have been an “in”, so I made that change in the pattern. There is a difference in “over” and “in” for this pattern. “In” is used when stitches are made in the gap formed by chain stitches or when a stitch is made in the top of a stitch from a previous row. “Over” is used when stitches are made over the stitch from the side of the stitch. For example in row 3 the tr stitches form little loops in a similar way that chain stitches would. The stitches in row 2 are made by inserting the hook into those loops so that when the stitch is made it anchors at the bottom around the trunk of the tr.